Kerstin Hörlin-Holmquist, Little Adam Lounge for Nordiska Kompaniet, 1958, Paradiset series, Triva Collection. Newly reupholstered in off-white herringbone fabric. The Paradise collection was a mid-century hit when it came on the market for a younger audience looking to purchase furniture with a more contemporary feel at the time. A very unique piece by a female designer from Sweden inspired in the Garden of Eden. The Paradise collection is a Scandinavian Modern design that reflects a transition from traditional to modern for the mid-century home. Newly upholstered in multicolored fabric with salmon overtone blue and green undertone with texture. Minor nicks on wooden legs, Original metal label reattached under chair post upholstery. A vintage pair of Art Deco Club Chairs from Sweden, freshly reupholstered in a light mustard yellow fabric with a herringbone texture. The pair is very comfortable and the perfect size for smaller rooms. Classic and traditional, just add throw pillows of choice. Wood legs and armrest have not been refinished and have minor nicks and scratches, could be highly lacquered for a sleek look or kept as is for a preloved vintage addition to any home. We couldn't resist giving this vintage Art Deco pair a fresh look with Pantone color of the year: Living Coral. The Swedish pair have lively hoop arms, distinct from its Art Deco era. They have an overall great proportion for small spaces, perfect for reading nooks and side seating. Very comfortable, springs are in excellent condition. Minor scratches on wooden armrests and legs consistent with age and use but overall great condition. New upholstery. 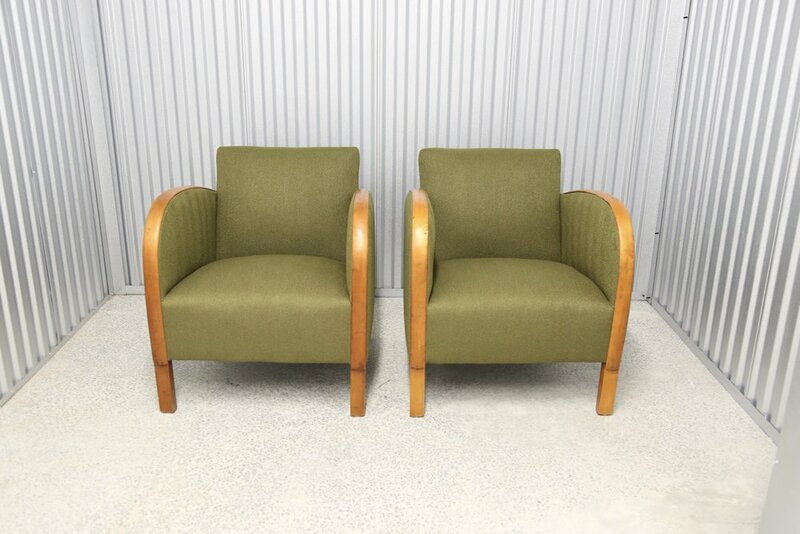 A beautiful example of Swedish Art Deco, a pair of club chairs that have been reupholstered in army green. Fabric has a small chevron texture. Wooden arms and legs are in good condition, consistent with age and use. Great for small apartments, chairs are small in proportion, very comfortable. Springs in great condition, original. 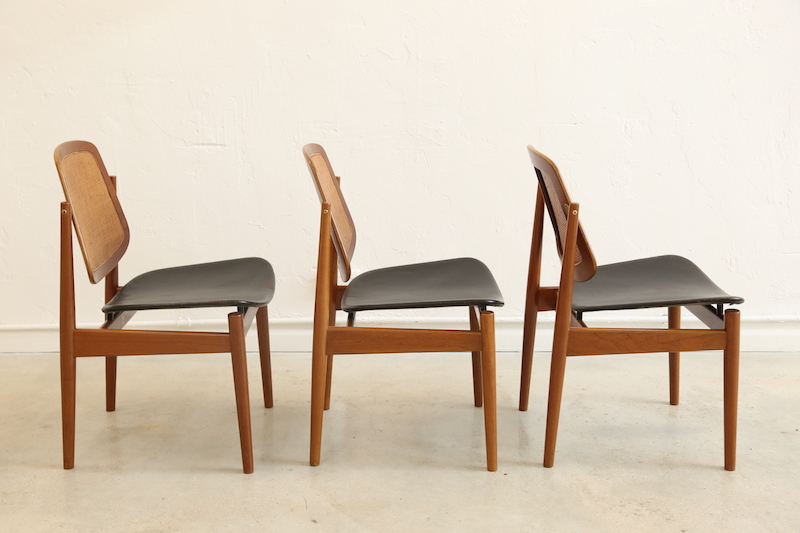 A great set of Mid-Century Modern dining chairs from Rødovre, Denmark made by Boligmontering. Newly refinished and reupholstered. The upholstery is by Knoll Atelier in Confetti a durable and classic fabric. The chairs have a beautiful detail of different wood finishes, great craftsmanship. Chairs are stamped underneath. A rare desk chair from the company Ring Mekanikk from Norway in aluminum and leather, a great example of Scandinavian Modernism. Late 50s/ early 60s in the style of Charles Pollack for Knoll and Martin Stoll for Giroflex- early examples of aluminum and steel base desk chairs. The desk chair is in a nice vintage condition consitent with age and use. The leather has small signs of paint on the seat barely noticeable, no rips or tears in leather. A great chair for creatives, comfortable and sturdy. The chair swivels, raises and tilts. The color is chocolate brown. Signage reads "Made in Norway Ring Mekanikk Patents applied for". The comfort of a leather chair without the bulkiness of a leather chair. 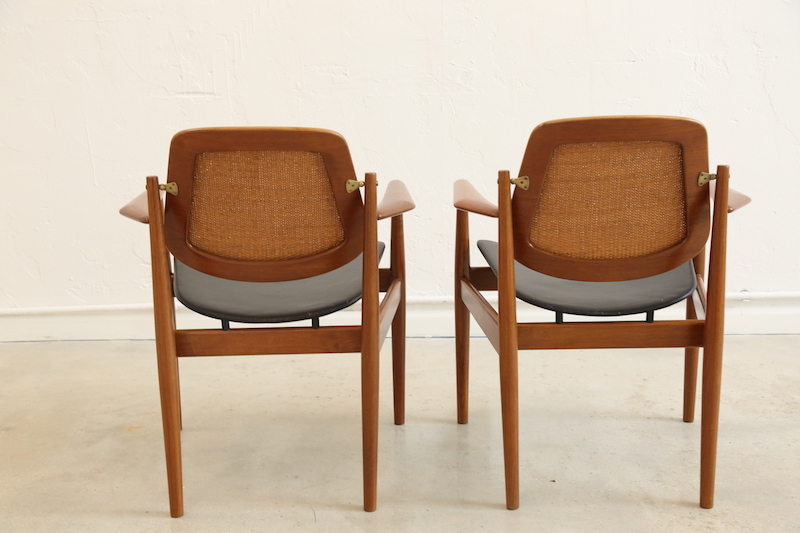 Made by Göte Möbler (G Mobler) this "Carmen" easy chair pair is in great vintage condition. Light patina on the leather, most noticeable on the armrests as seen in pictures. Cushions are removable from chair with zipper opening for easy cleaning. Wooden legs are beautifully craved and stained, with minor nicks, barely noticeable. Signage is on a little metalic plate on each chair. Very comfortable and sturdy. Seat height: 18 inches. Color is caramel. Lounge chair in the style of the Vatne 965 High by Fredrik A. Kayser, 1964 for Vatne Mobler, Norway. Creator is unknown. The leather is in great condition great vintage patina consistent with age and wear. Legs are in an excellent condition, beautiful wood finish. Headrest pillow held in place by leather weight. A Scandinavian modern style (1960 - 1969). Lounge chair in the style of the Vatne 965 High by Fredrik A. Kayser, 1964 for Vatne Mobler, Norway. Creator is unknown. The leather is in great condition great vintage patina consistent with age and wear. Legs are in an excellent condition, beautiful wood finish. A Scandinavian modern style (1960 - 1969). 22.25W × 20D × 29H inches. A design collector's piece with a classic Danish look. This Finn Juhl model 196 chair in teak and leather was designed in Denmark circa 1961. This model was made in male and female versions, with the female version (this piece) featuring a shorter seat back than the male counterpart. The frame is solid teak with a rich grain and a clean line. The upholstery is in excellent condition. 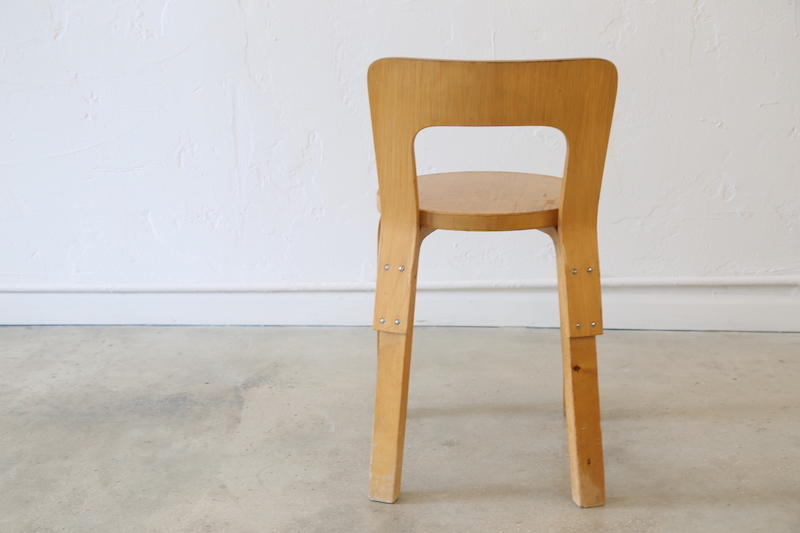 The chair has its original stamp from the manufacturer France & Søn and it's serial number. Seat height is 17 inches. Produced by France & Søn in Denmark, these Arne Vodder designed dining chairs are in excellent condition, chairs and cane backing have been refurbished and are as new, original leather seats have light patina on them. All 3 chairs have their marks from France & Søn and from Illums Bolighus, the department store in Copenhagen from which they were purchased in the 60s. Acquired directly from the original buyer's home who owned them for over 45 years. Extremely comfortable, the backs of these chairs sway on a brass hinge which is original and in excellent condition. A collectible pair and great addition to any dining set or sitting corner. Seat height is 17 inches. 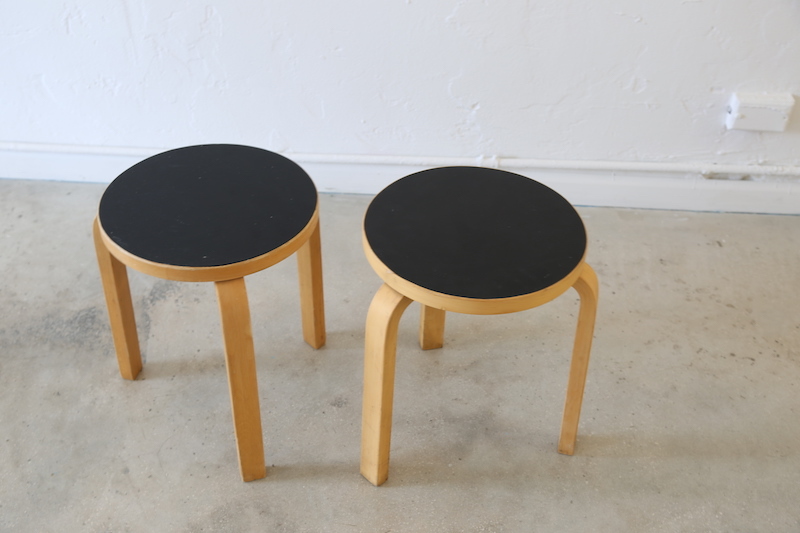 This pre-loved pair of black Alvar Aalto stools are a classic addition to any room. The Stool 60 was designed in 1933 by Finnish designer Alvar Aalto, who is considered as one of the founding fathers of modern design. The bentwood solution of the Stool 60's L shaped leg is popular among all of Aalto's pieces. Not only was Aalto concerned with formal design concerns but also in the spirit of beautiful materials and the simple forms of modernism. Aalto was a fan of artists such as Jean Arp and Brancusi. These stools are in lovely used condition, the black laminate is in great condition, one of them has minuscule white speckles on it. Great as additional seating, or side tables they can be kept in any corner stacked and ready to use. Not sure the year in which these were produced. Obtained directly in Helsinki from Artek 2nd cycle in Finland. 13.75W × 13.75D × 17H inches. This pre-loved Alvar Aalto Chair 65 is a classic addition to any collection. Chair 65 was designed in 1935 by Finnish designer Alvar Aalto, who is considered as one of the founding fathers of modern design. The bentwood solution of Chair 65's L shaped leg is popular among all of Aalto's pieces. Not only was Aalto concerned with formal design concerns but also in the spirit of beautiful materials and the simple forms of modernism. Aalto was a fan of artists such as Jean Arp and Brancusi. This chair is in lovely used condition, the wood has a nice patina on it. Great as additional seating, or as a side table, it's a collectable piece for any interior room. Not sure the year in which this particular chair was produced. Obtained directly in Helsinki from Artek 2nd cycle in Finland with official Artek sticker underneath. Seat height 17.4 inches. Urban Blooms. Huge irrepressible flowers infuse the Siirtolapuutarha Marimekko print with joyous energy. Triumphant flora in a chaotic metropolis inspired designer Maija Louekari. This pouf is a perfect addition to your living room or bedroom and brings color to your home. Fabric produced by Finnish design company Marimekko. 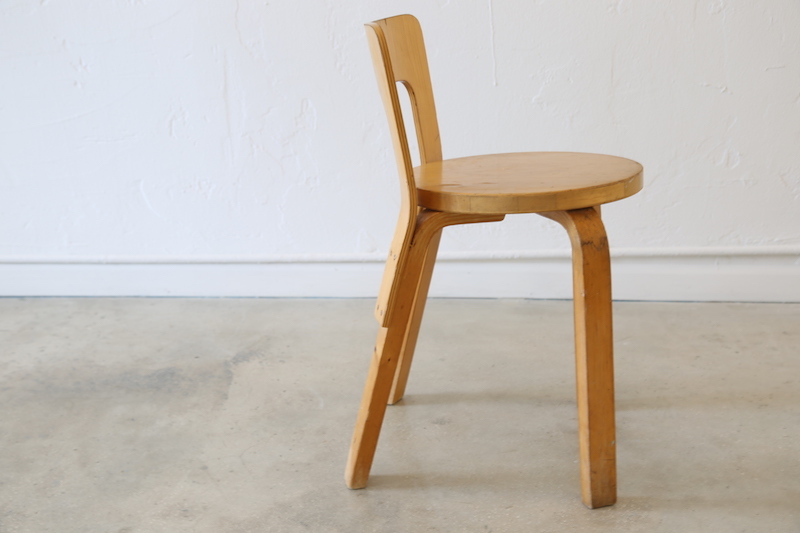 This pre-loved Alvar Aalto stool is a classic addition to any room. The Stool 60 was designed in 1933 by Finnish designer Alvar Aalto, who is considered one of the founding fathers of modern design. The bentwood solution of the Stool 60's L shaped leg is popular among all of Aalto's pieces. Not only was Aalto concerned with a formal design but also in the spirit of beautiful materials and the simple forms of modernism. Aalto was a fan of artists such as Jean Arp and Brancusi. This stool is in a lovely used condition. 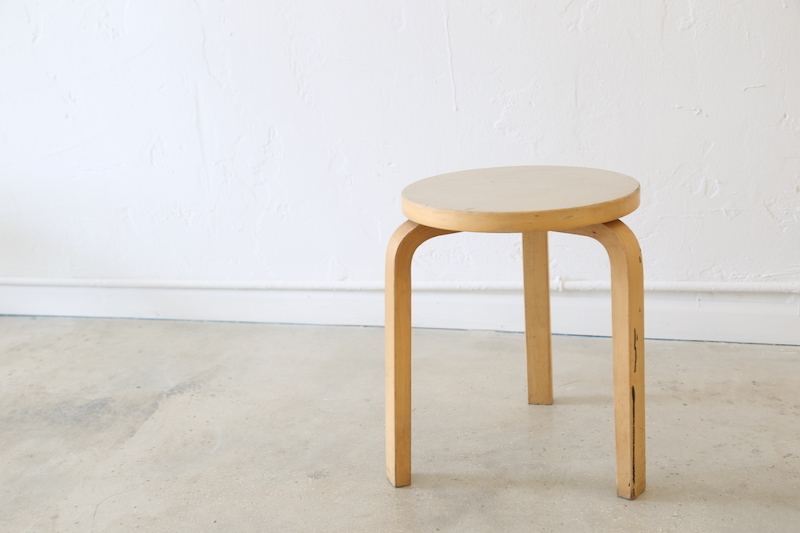 Great as additional seating, or side table this stool can be kept in any corner ready to use. Obtained directly in Helsinki from Artek 2nd cycle in Finland. Materials & Technique: Heavyweight cotton, Knife edge. Foam insert. 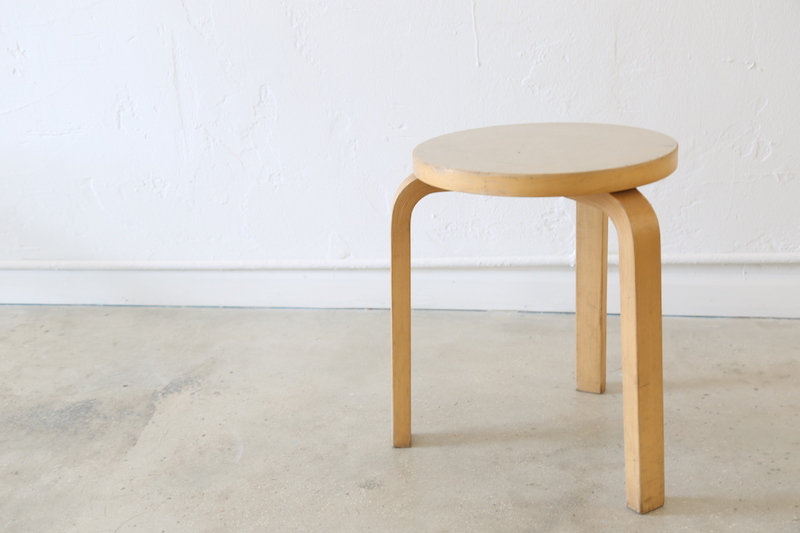 This pre-loved light gray Alvar Aalto stool is a classic addition to any room. The Stool 60 was designed in 1933 by Finnish designer Alvar Aalto, who is considered as one of the founding fathers of modern design. The bentwood solution of the Stool 60's L shaped leg is popular among all of Aalto's pieces. Not only was Aalto concerned with formal design concerns but also in the spirit of beautiful materials and the simple forms of modernism. Aalto was a fan of artists such as Jean Arp and Brancusi. 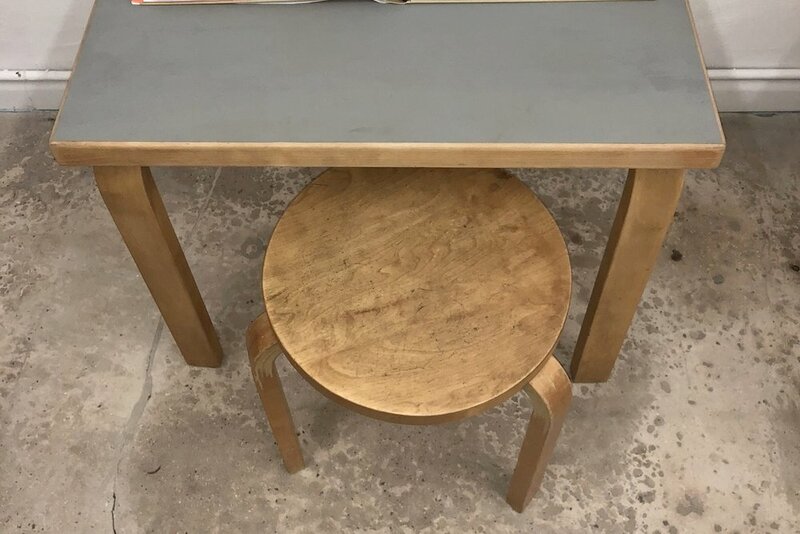 This stool is in a lovely used condition, the light gray laminate is in excellent condition, while the wood shows signs of history. Great as additional seating, or as a side table this stool can be kept in any corner ready to use. Not sure the year in which this piece was produced but it has definitely seen its years as the varnish is older. Obtained directly in Helsinki from Artek 2nd cycle in Finland. 13.5W × 13.5D × 17H inches. 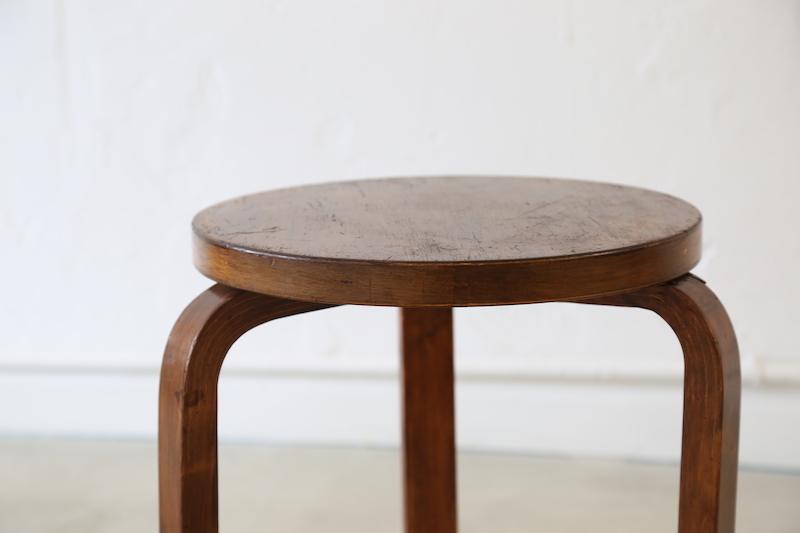 This pre-loved dark brown Alvar Aalto stool is a classic addition to any room. The Stool 60 was designed in 1933 by Finnish designer Alvar Aalto, who is considered as one of the founding fathers of modern design. The bentwood solution of the Stool 60's L shaped leg is popular among all of Aalto's pieces. Not only was Aalto concerned with formal design concerns but also in the spirit of beautiful materials and the simple forms of modernism. Aalto was a fan of artists such as Jean Arp and Brancusi. This stool is in a lovely used condition, great as additional seating, or as a side table this stool can be kept in any corner ready to use. 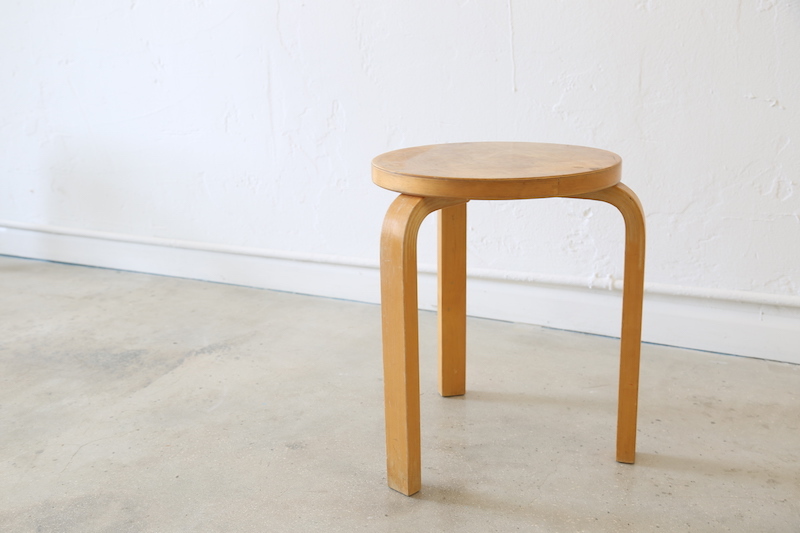 Obtained directly in Helsinki from Artek 2nd cycle in Finland, the stool has a stamp from Artek barely visible underneath. Inspired by grandmothers Britta and Maj, Liselotte Watkins designed this new, large-scale Britta-Maj print on a cotton and linen blend fabric for Finnish textile company Marimekko. The fabric has been used on a vintage Swedish armchair probably from the 30s/ 40s. Seat height 15 inches. Great for small apartments, reading corners and added pops of color. 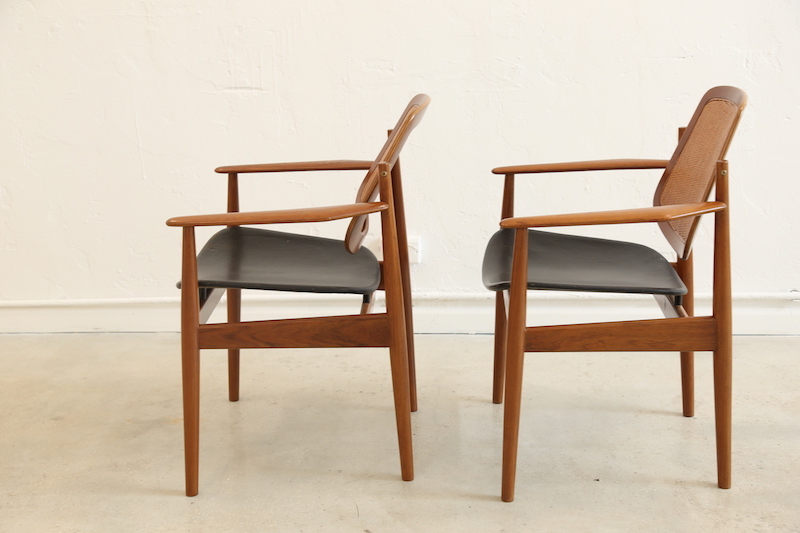 A pair of easy lounge chairs “Eva” designed by Pethrus Lindlöf. Produced by AB Lindlöf Möbler Lammhults Sweden in 1969. Scandinavian Modern, Mid-Century, pre-loved. Chrome plated tubular steel and leather. Cushions have been recently reupholstered. Leather and canvas are in excellent condition. Wear of the caster wheels are consistent with age and use. Made in Sweden. Seat height is 14 inches. Folke Pålsson was part of the Danish design collective FDB Møbler, founded after the Second World War. FDB Møbler was inspired in the German Bauhaus movement. This Spindle chair is inspired in the classic Windsor chair with a Danish approach of simplicity and modernity. Folke Pålsson is best known for the J77 chair which is currently produced by HAY. Beautifully stamped FDB Made in Denmark on the underside. Seat height 17 inches. A beautiful example of Swedish Art Deco, a pair of club chairs that have been reupholstered in taupe. Fabric has a suede texture. Wooden arms and legs are in good condition, consistent with age and use. Great for small apartments, chairs are small in proportion, very comfortable. Springs in great condition, original. A beautifully made wooden bench with spindle back imported from Sweden. A clean traditional style with mid-century pin legs which screw on to the bottom. Made from 2 varieties of wood, pine for the seat and oak for the backrest. Newly refinished, very light gloss. A great addition to any room, entryway or corridor. Ingemar Thillmark, Läckö Hög Armchair. The Läckö Hög armchair designed by Ingemar Thillmark was produced by OPE Möbler, Sweden during the 1960s. Made of buffalo leather and beech wood. 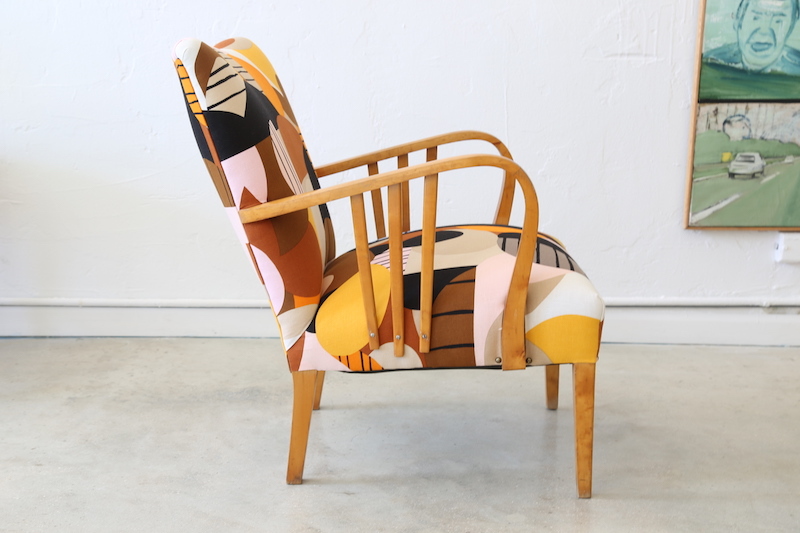 Great accent chair with a classic Mid-century Scandinavian look and feel. 30W × 27D × 29H inches. Scandinavian, mid-century modern teak Danish Chair. 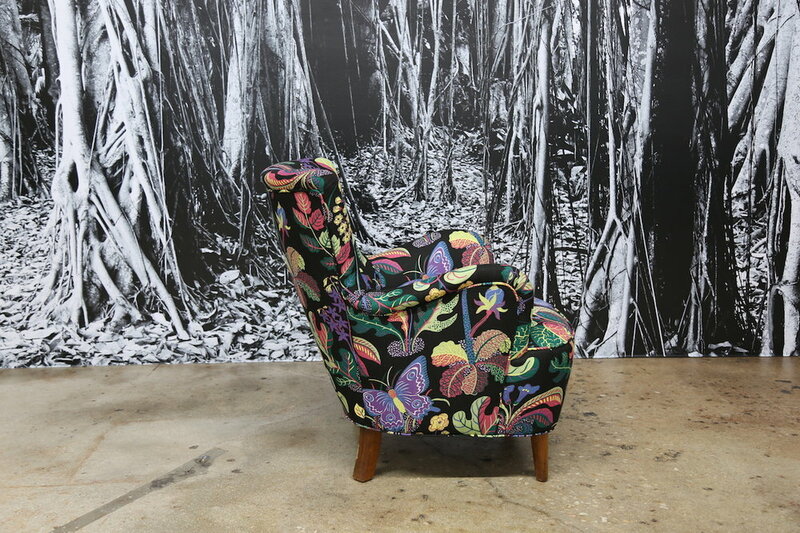 Designer is unknown, has been newly upholstered in Schumacher 1898 fabric. Wooden frame is in excellent condition. 26.5W × 28D × 34H inches. Beautiful green corduroy club chairs circa 1930s made in Sweden. Size is perfect for sitting area, small apartment, library or office. Cozy dark wood with a nice patina on armrests and legs. Upholstery is in good condition but perfect for a custom project. This bassinet cradle was purchased in Mexico from its original owner, a family who used the bassinet for all of their children. In really great condition, the wicker rattan has only minor usage marks around the handles and light scuff marks on the rocking legs. Perfect for babies 0-6 months. A unique find, perfect for that balanced room with a natural, boho feel. Bassinet mattress not included for sanitation but measurements work with new mattresses. This set is fantastic, not only because the cane is in perfect condition but also they are a true classic for any home wanting a vintage touch. The design is originally the 811 dining chair by Josef Hoffmann who designed them for Thonet, a 150 year old company. The history of the Thonet manufacturing company involves family wars and several countries, these chairs form part of that history. These are all stamped Made in Poland and most of them have the FMG original paper label on them, some of them have additional codes on the paper labels and some chairs have numbers engraved in the bottom of the chair. Most likely they were produced in the 60s but I cannot verify that. What I can tell you is they have been loved and the wood has an aged patina on them and the cane is in excellent condition. Set of 6, seat height is 18 inches. A wonderful little rocker chair for your mini. Produced by Legacy, the rocker is called the Reese Rocker as seen on the chair's label. The bentwood chair is in excellent condition, a unique and rare design indeed. Minor nicks on the rim from 20 years of use but in overall excellent condition. Perfect for playrooms and nurseries. Kids can have great design items too, a great alternative to plastic furniture. Rocker chair is lacquered and durable. Specific designer and year of design unknown. A set of turn-of-the-century Fischel Thonet style bistro chairs. Found in Sweden these bentwood chairs have been cleaned up and refinished to highlight the beautiful embossed Art Nouveau design. Chairs have been reinforced and are in good condition. 2 out of 4 are a bit wobbly and the plywood back of 1 chair is a bit cracked from humidity, see photos. Great as side chairs, decorative corner chairs, end tables, night stands, book holder, plant holder, occasional seating, bathroom towel holder, and guest seating. Manufactured by Göte Möbel in Sweden (G Möbel on the plaque). This leather pair of lounge chairs sit on beautiful bentwood frames, most likely teak. In a style from the late 60/70s. The leather is worn in with a nice patina, no rips. Lounge chairs are very comfortable. Back is upholstered, see pictures. Seat height is 15 inches. Wicker rattan and bamboo pair of clam lounge chairs in excellent condition. Mid-century design, designer unknown. Metal frame has a nice patina on it. A unique pair and a great addition to any living space, perfect for a sheep skin or Mexican throw blanket. Seat height is 15 inches. The label makes out to read Noordwolde, Holland. Rohe Noorwolde is a company in a village of Noorwolde in the Netherlands well know for its wicker production. Seat height is 15 inches. Set of 4 wicker rattan counter stools in great condition. Mid-century design by Seng of Chicago. Metal frame has a nice patina on it. A great addition to any living space, classic mid century look. It looks like there has been some restoration done to them from underneath. Great for family rooms, the natural materials add a nice texture to any decor. This original Eames Chair is called the LAR (Lounge Arm Rod) Armchair and is part of the low living lifestyle series of furniture pieces that were produced by Herman Miller. Designed in 1949 by Charles and Ray Eames, the cat cradle base is made of zinc plated steel and the shell seat is made out of fiberglass. A historic piece no longer produced by Herman Miller. The yellow color is in a beautiful vintage tone. Seat height is 12 inches. Reupholstered Scandinavian wingback chair in olive green velvet fabric. A 1940s look with a contemporary touch in 2017's Pantone color of the year greenery. It's a comfortable lounger for reading with great head support and curved upward arm rests. It's an understated statement chair, that glam touch to any room. Seat height 18 inches. This is a timeless pair of modern Falcon chairs by Norwegian designer Sigurd Ressell for Norwegian furniture company Vatne Møbler. They are very comfortable, with lumbar support in a hammock-like design. Collectible and an easy addition to any interior design setting, as seen in the Architectural Digest feature of Liev Schreiber and Naomi Watt's New York Apartment. The cognac color leather is a beautiful contrast against the darker wood. Wooden legs are in excellent condition. Seat height is 17 inches. 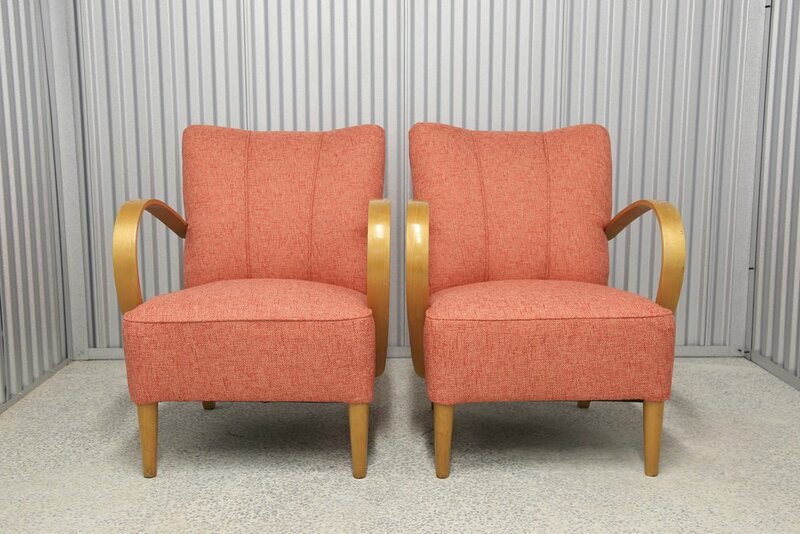 Timeless pair of Scandinavian Art Deco club chairs with bentwood hoop arms. Creator is unknown (cabinetmaker), newly upholstered in black velvet. Perfect for small spaces, side chairs. Wooden legs great condition for age and wear is consistent. Period 1930s. Vintage pair of Swedish leather armchairs in a wooden frame. The creator is unknown, 70s look. Very comfortable, soft leather. Leather has a nice pre-loved patina on it, the wooden frame is in excellent condition for its age. It's that chair you kind of melt into and you'll want to curl up in with a blanket. Seat Height is 16 inches. 33W × 38D × 33.5H inches. Art Deco club chairs with a shell/fan back motif and bentwood armrests. 27W × 35D × 33H inches. Produced by France & Son in Denmark, these Arne Vodder designed armchairs are in excellent condition, chairs and cane backing have been refurbished and are as new, original leather seats have light patina on them. Both chairs have their marks from France & Søn and from Illums Bolighus, the department store in Copenhagen from which they were purchased in the 60s. Acquired directly from the original buyer's home who owned them for over 45 years. Extremely comfortable, the backs of these chairs sway on a brass hinge which is original and in excellent condition. A collectible pair and great addition to any dining set or sitting corner. Seat height is 17 inches and armrest height is 25 inches.